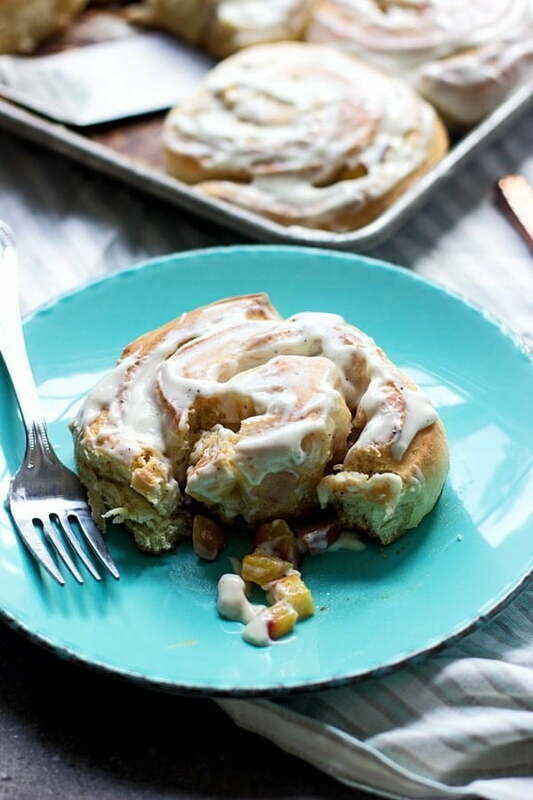 These Peach Brown Butter Sweet Rolls with Cream Cheese Brown Butter Glaze are a sweet taste of summer. They’re a labor of love, but worth the effort! My husband is a simple guy and one of the most laid back people I know. He loves watching sports, monitoring the progress of our yard, drinking cold Miller Lights, eating Chipotle and playing with our kiddos. In general, he doesn’t ask for much from me, contrary to how much I ask out of him (fix this, hang that, paint this ENTIRE house). When it comes to food though, that’s a different story. While he willingly tries every single crazy concoction that comes out of our kitchen without complaint, I know he’d be perfectly content with steak and potatoes, burgers or frozen pizza every night of the week. He rarely requests anything for me to make, simply because he knows my mind is always going a million miles a minute with new recipe ideas, but every once in a while, he demands one of three things: stir-fry, plain buttermilk pancakes or sticky buns. Most times I’m extremely willing to comply, especially when it comes to stir-fry or pancakes since they are quick-cooking and easy to throw together, but these last couple months have been extraordinarily busy, which will happen when you add another bambino to the mix. SO the thought of spending three hours cranking out homemade sticky buns hasn’t exactly been at the forefront of my mind. I’ve had the idea for this recipe since last summer, except instead of peaches I wanted to try an upside-down pineapple variation, but just never got around to it. Last week, when Kevin practically begged for his beloved sticky buns, I knew I needed to grant him his wish. Plus I’d been stocking up on peaches for the past few grocery tricks and thought that they would make the perfect seasonal substitute for the pineapple version I’d been dreaming up in my head. This sweet bun recipe is something I use over and over again and is somewhat adapted from this Cooking Light version, it’s super easy to throw together, and requires very little hands on time, which I love. Instead of sprinkling the surface with the typical butter, cinnamon and sugar, I browned a few tablespoons of butter until it was nutty and chestnut-hued, then sprinkled the surface with dark brown sugar (you can use light if that’s what you have on hand) and then covered the whole thing liberally in diced peaches. The dough gets rolled up jelly roll style, cut into 1-inch pieces, nestled into a greased baking dish and then they’re left to rise one last time before they’re get popped into the oven to bake. While the rolls are baking, I whipped up a super quick cream cheese glaze with a twist. Instead of using plain softened butter, I again, browned it, then transferred it to a small dish, threw it in the freezer until it solidified again, and then whipped it up with the softened cream cheese. After a touch of vanilla is added in, powdered sugar follows suit and everything is gently mixed together until its smooth. An optional, but recommended touch? Sprinkle in a little bit of flaked sea salt at the end. Once the rolls come out of the oven, they’re smothered with the brown butter glaze while they’re still hot and then they’re ready to be inhaled. In a stand mixer mix warm milk, sugar and yeast. Let sit until foamy, about 5-7 minutes. Add in eggs, salt and melted butter. Mix until combined. With the mixer on a low seed add four cups flour. Once combined dump dough out on to a floured surface. Dough should be tacky, but if it's too wet, add ¼ cup to ½ cup of flour. Knead dough until smooth, about 5-6 minutes; add a little bit of flour if too sticky. Transfer to a greased bowl and place in a warm, draft free place. Let rise one hour. Punch dough down, flip around and let rise another 30 minutes. Roll dough out to a 13x15 rectangle. In a small non-stick, heat 2 tablespoons butter over a medium-high heat. Swirl the pan until the butter begins to brown, once it's a dark brown color and smells nutty, transfer to a bowl to cool slightly. Brush on dough. 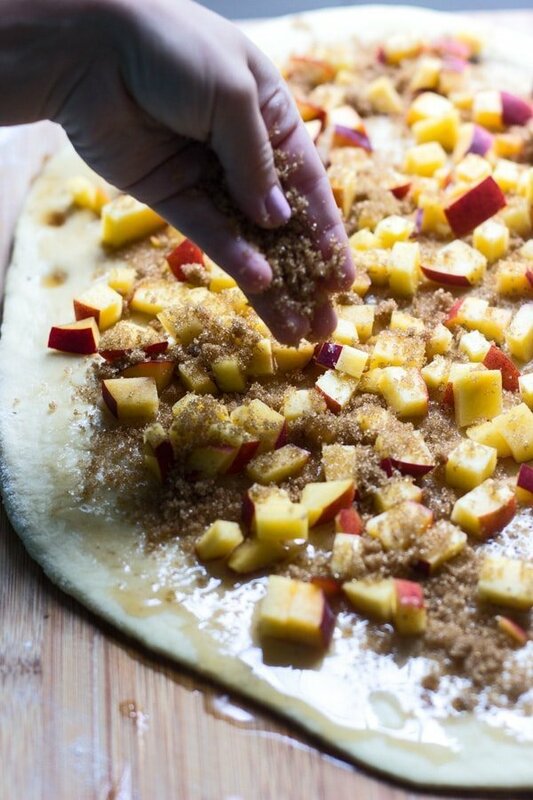 Sprinkle dough with brown sugar followed by peaches. Roll dough up, jelly roll-style. Cut into 1-inch rolls. Place in a greased 9x13 baking dish. Cover and let rise another 30 minutes. Bake rolls until light brown and cooked, about 30 minutes. Let rest for a minute or two and then spread with glaze. While the rolls are baking heat the butter in the same non-stick skillet over a medium-high heat. Swirl the pan until the butter begins to brown. Once the butter is dark brown and smells nutty, remove from heat and transfer to a small bowl. Place bowl in the freezer to solidify the butter, stir every five minutes. It should take about 15 minutes for the butter to return to a softened solid state. In the bottom of a stand mixer fit with a paddle attachment, beat the butter and cream cheese until combined and fluffy. Add in vanilla, beat until combined. With the mixer on low, add in powdered sugar. Increase speed to medium and beat until smooth. At the last minute, add in a touch of flaked sea salt. 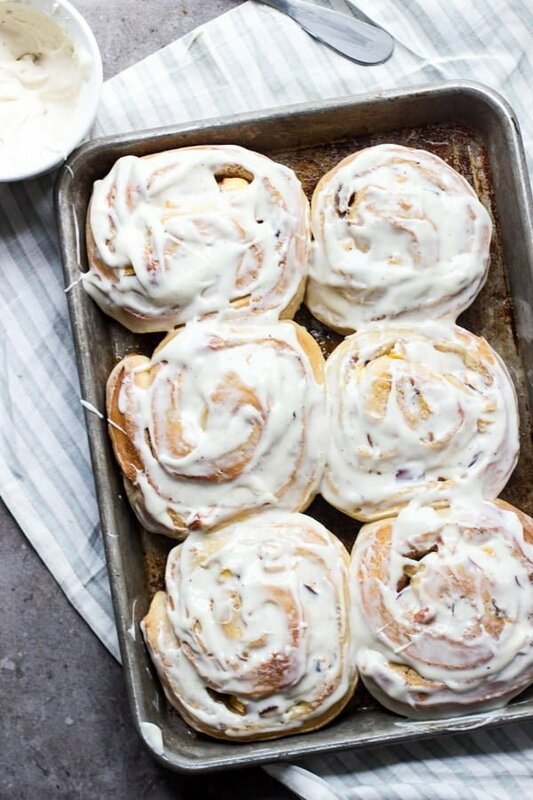 24 Responses to "Peach Brown Butter Sweet Rolls with Cream Cheese Brown Butter Glaze"
I LOVE how you have NO WORDS. Just pictures! THIS IS GENIUS. And the peach and brown butter combo? Please mail me some. Pinned! Bahahahaha, wellllll I wish I could claim genius, but the only reason there are no words is because it published before I could put them in. ha! I’ll keep that in mind for another time though…. 🙂 Thanks love! Wow do these rolls look amazing! I’m pretty much addicted to anything made with peaches, but the brown butter and cream cheese glaze takes these babies to a whole new level. Sounds perfect! Your husband and my husband should get together — they are basically the same person when it comes to food. 😉 Which means we would devour these in a second in our house! Love the addition of sea salt, too. Honestly I just love how many times the words ‘brown butter’ are mentioned in this post! Never thought much of peach in my sweet rolls but hey, as long as there is brown butter involved I’m pretty convinced! 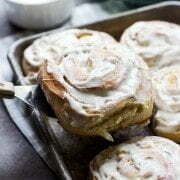 Growing up my Mother made homemade cinnamon rolls during the winter. 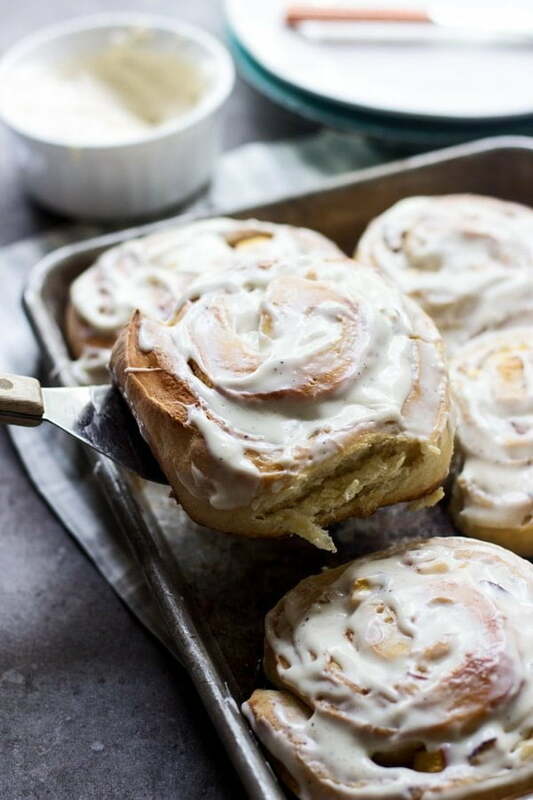 Nothing is better than the smell of melting cinnamon, sugar and fresh bread. My mouth is watering at the thought of it. Duuuude Nicole these are crazy. Peach. Brown butter. carbs. You’ve got it goin on here. Also, stir fry? I love that stir fry is on his list. haha. Isn’t it funny how food blogger’s families are always begging for “normal” recipes? “Please, no nutella swirls, I just want plain ol freaking buttermilk pancakes! !” haha poor things. Mmm…I can see why your husband would request these! 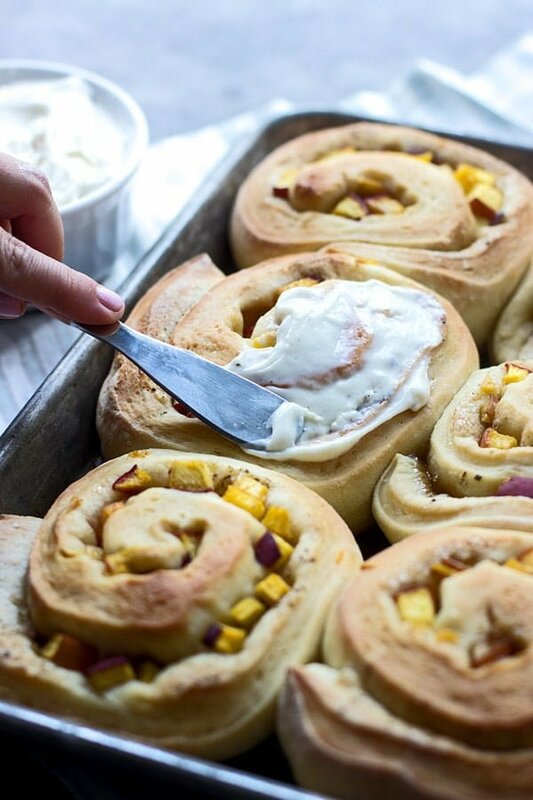 I love a good cinnamon roll and stuffing them with peaches is brilliant! You’ve got my mouth watering!! Oh my goodness, I would have no choice but to inhale these beauties! And then go back for seconds of course. 😉 Loooove the brown butter + peaches + cream cheese combo goin’ on! Pinned. Mmmmm…brown butter. Is there anything better. These look amazing. I want to face plant right into that whole pan. And you’re dog’s name is Ravioli! How did I not know that before! Love it! My dog came from the animal shelter, so she all ready had a name and I just kept it so I didn’t get the pleasure of naming her. But I always want dogs names after beverages – bourbon or porter or something like that. You know, because I’m a booze hound. Ha ha ha! Girrrrrrrl these are right up my sweet alley. Brown butter, peaches, carbs, and glaze!! I can’t pick what I love most!! 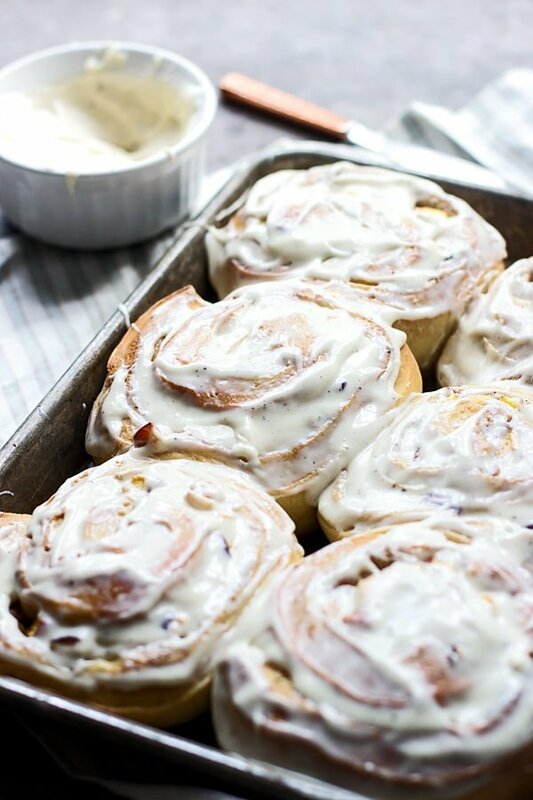 These rolls look so tasty! I love all that browned butter! These sound amazing! Instead of making dough yourself you think the recipe would work and be ok if I bought pie crust dough? 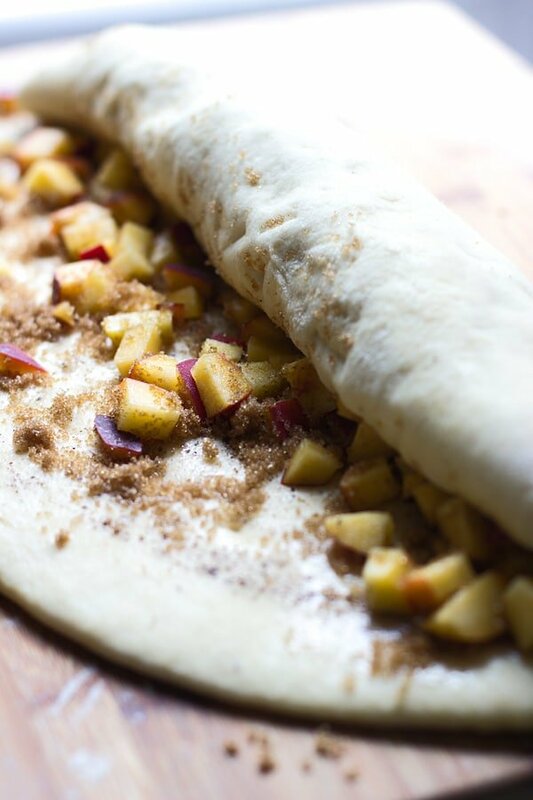 It will definitely not work with pie crust, but you can buy bread or pizza dough!